At IDSecurityOnline, we service what we sell! If you are experiencing issues with your ID card printer, we will assist you until the problem is completely solved and your ID card program is back on track. We offer a wide array of tools to help you resume your card production in a timely manner. When you buy a card printer from us, you partner with an ID expert who will offer you personalized support at all times. We back this promise with a unique program called IDPlus. Click here to learn more about IDPlus. When you are having issues with your printer, the first step is to visit our troubleshooting page. All you need to do is select your printer, and you will have access to step-by-step instructions on what how to fix the most common issues with your card printer. To get started, visit our Troubleshooting page. If after troubleshooting your printer, your printer is not functioning properly, you can fill out our Printer repair form to determine if your printer needs to be sent to our certified repair center. We stock all parts to fix your printer fast and minimize downtime. If your printer is under warranty, you can request a loaner printer at no charge until yours is fully operational at your location. Do you need help with your ID card system? We got you covered for life! Call us at 1-800-897-7024 whenever you need it and get answers for FREE! If your printer is under warranty, we will fix it for FREE! Beyond the warranty period, we will service your printer at the best rates of the market. IDSecurityOnline is a certified repair center for all major card printer brands. We stock all parts to fix your printer fast and minimize downtime. 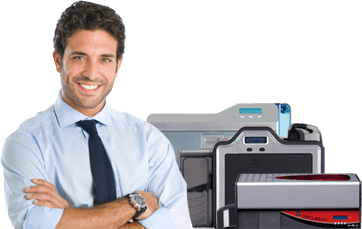 If your printer is under warranty, we will send you a loaner printer at no charge until we repair yours and that it is fully operational at your location. Extended warranty contracts of one, two and three years are available at unbeatable prices. All warranty contracts include parts, service, and labor. HOW CAN I BENEFIT FROM IDPlus? When you purchase an ID Card printer or photo ID system from us, you automatically qualify for our IDPlus program. HOW MUCH DOES IDPlus COST? The program is completely FREE and you get toll-free support, free warranty repairs and unbeatable rates on out-of-warranty repairs. For full details on the IDPlus program, download our IDPlus brochure. Does your card printer need to be repaired? We've got you covered! IDSecurityOnline is a repair center for all major card printer brands. Our technical support team has been trained and certified to fix your machine fast! Fill out the form below and hit 'Submit'. An email notification with an assigned Service Authorization number will be sent to you. Prepare your shipment: box your printer carefully and include a printout of the email with your Service Authorization number. Please do not put shipping peanuts in the box with the printer as this may cause further damage to the printer.